​Pick a Gemstone from the list below. Garnets celebrate the 2nd anniversary of marriage. 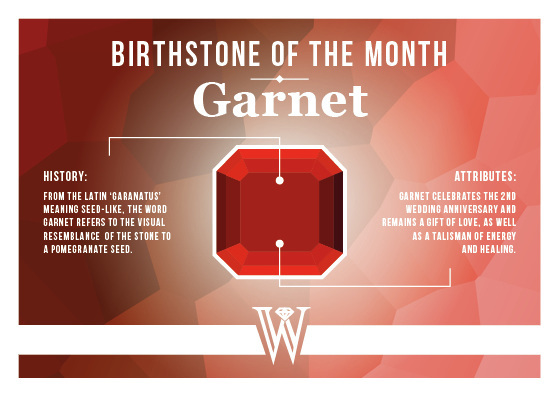 The word garnet comes from the 14th century Middle English word 'gernet' which means 'dark red'. Commonly available in dark red, garnets can also be orange, yellow, green, purple, brown, blue, black, pink, and colourless! Amethysts celebrate the 6th anniversary of marriage. This rich violet stone has been used in Royal collections all over the world, including our British crown jewels! 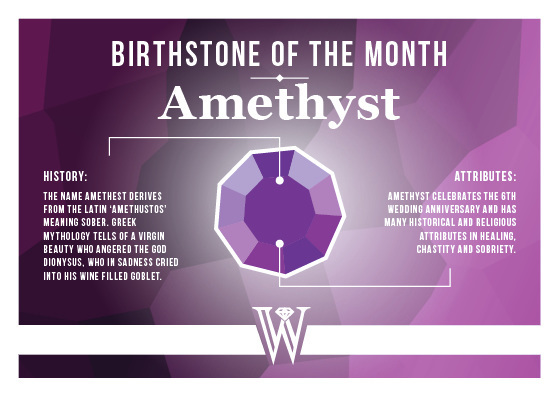 Amethysts are a member of the quartz family. The best varieties of amethysts are found in Siberia, Sri Lanka, Brazil and the far east. The name aquamarine is derived from the Latin word for seawater, which also refers to the light blue colour of the gemstone. It also referred to as 'water of the sea'. Aquamarine is a member of the Beryl family. 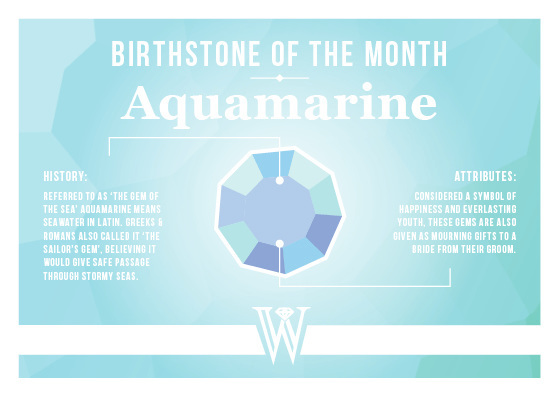 According to folklore, aquamarine would bring victory in battles and legal disputes. Diamonds celebrate the 60th anniversary of marriage. The hardest and most popular of gemstones. The word diamond is derived from the Greek 'adamas' which means indomitable. The value of a diamond depends upon four things - colour, cut, clarity and carat weight. 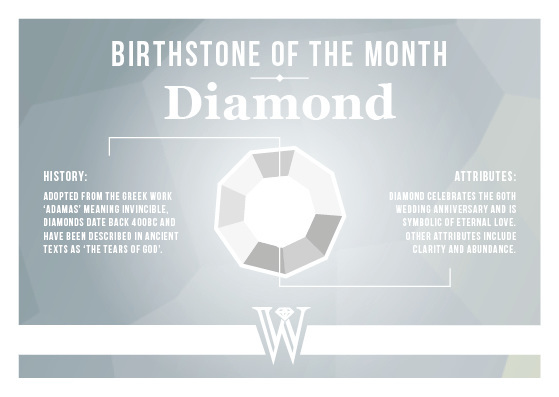 Greeks believed that diamonds were splinters of stars fallen to Earth or the tears of Gods. 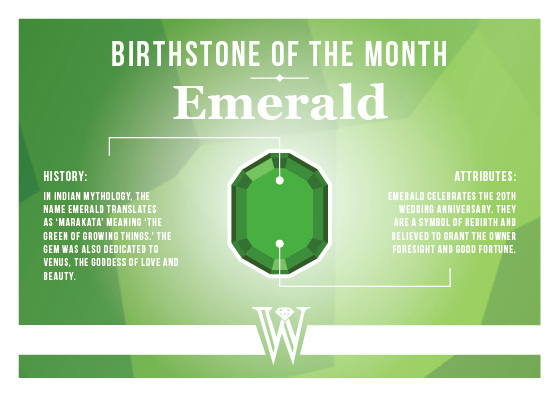 Emeralds celebrate the 55th anniversary of marriage. Emeralds is so prized, that carat for carat, a fine emerald may be two to three times as valuable as a diamond. Pearls are the gemstone for JUNE. 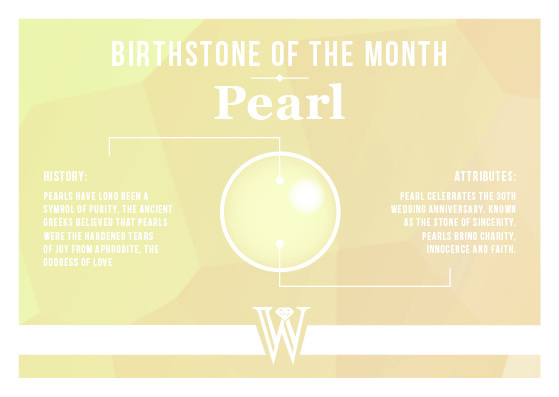 Pearls celebrate the 30th wedding anniversary. Pearls are organic - created by molluscs such as oysters and mussels. Pearls are created in nature when sand or grit gets inside an oyster and irritates the animal. To try and rid itself of discomfort, the oyster produces a shiny white substance called nacre which coats the grit to create a spherical pearl. These 'natural' pearls are extremely rare. Ruby celebrate the 40th wedding anniversary. Ruby is part of the corundum family of minerals and is only found in shades of red often termed 'pigeon's blood red'. 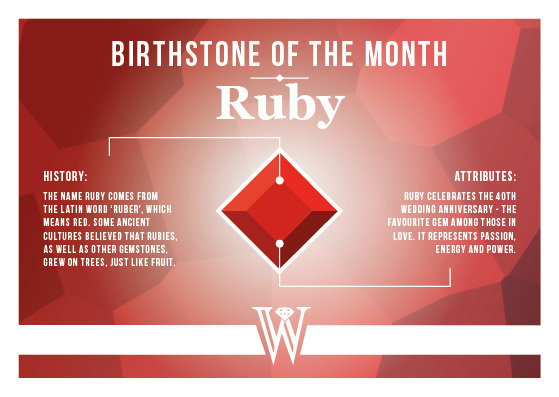 July is termed the hottest month of the year which also refers to the Hindu belief that rubies are like enduring fire,that if placed in water would boil over. Similar to sapphire, rubies are durable and have a hardness of 9, making them great for everyday wear. Peridot celebrates the 16th year of marriage. Peridot is sometimes referred to as 'olivine' due to the rich olive green colour of the gemstone. Mentioned throughout the bible, some Christians believe this stone to be sacred. Due to the softness of peridot, it is best to wear carefully and perhaps as a brooch rather than a ring. 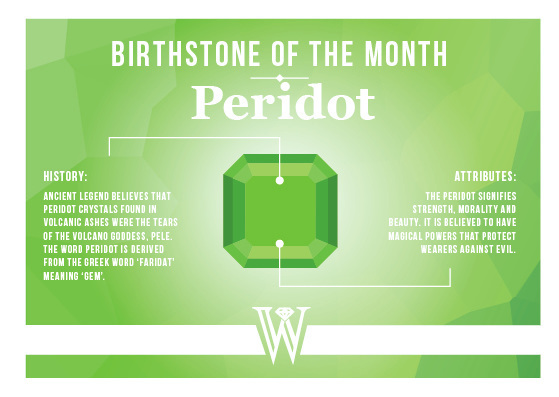 Peridot is a mineral gemstone found in lavas, meteorites and mafic and ultramafic rocks. 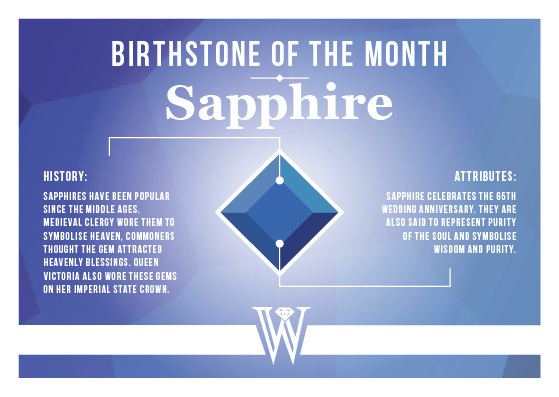 Sapphire celebrates the 45th wedding anniversary. Although popular for the rich blue colour, sapphires also come in other colours such as pink and green. These are called 'fancy sapphires'. Sapphires are very durable and is second in hardness to diamond. According to folklore, sapphire is the gem of the soul and also the gem of autumn. When light enters an opal it bends around tiny particles, creating a fire of rainbow colours. 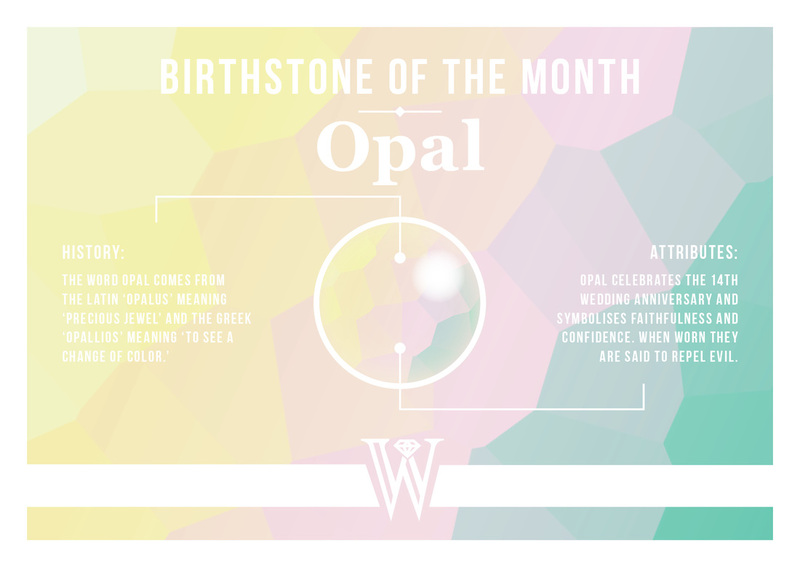 Approximately 95% of opals are produced in Australia. 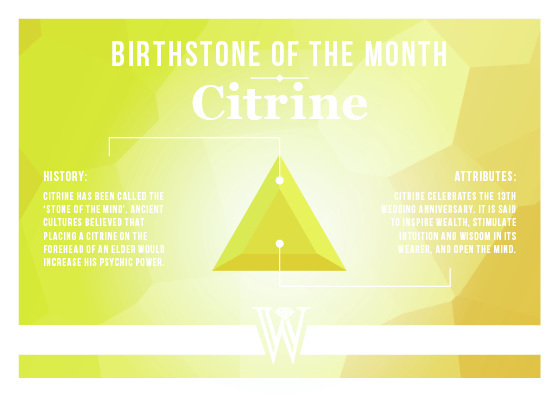 Citrine is a mineral gemstone and a member for the quartz family and is known for having a rich golden colour. Because of the yellow colour, the word citrine is also used when describing birds of paradise plumage, e.g. citrine wagtail. The largest supplier of natural citrine is the Rio Grande do Sol state in Southern Brazil. Turquoise celebrates the 11th wedding anniversary. 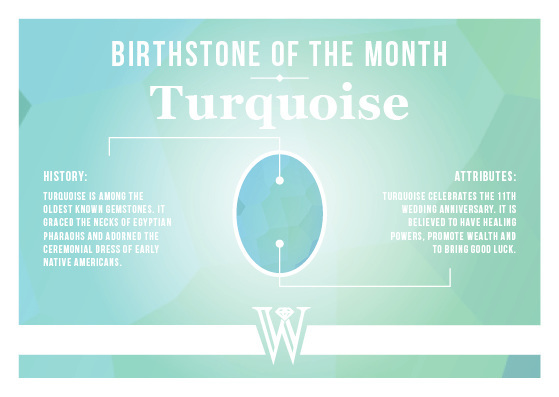 The word turquoise dates to the 17th century and is derived from the French 'turques' for "Turks" because the mineral was first brought to Europe from Turkey. Turquoise beads dating back to 5000 B.C. have been found in Iraq. Considered by some as a stone of strength and protection. Q) What are diamonds made of? A) Diamonds are made a colourless crystalline form of pure carbon (c), the hardest naturally occurring substance. Carbon is considered one of the 'building blocks of life'. Q) How are diamonds formed? Q) Where do diamonds come from? 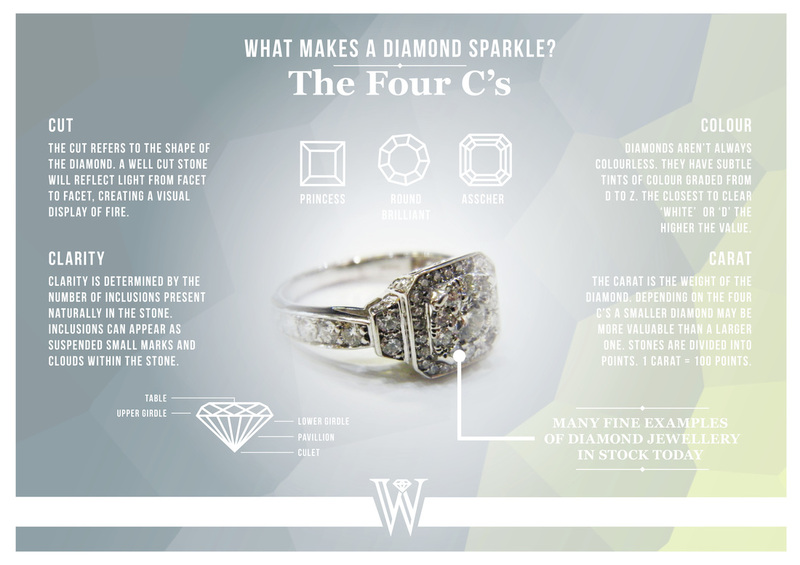 A) Natural diamonds are mined in approximately 25 countries across five continents. However, Africa, Russia, and Canada account for more than 90% of the world's natural gem-quality diamond production. DID YOU KNOW - The first known use of a diamond engagement ring took place in 1477, when Archduke Maxmillian of Austria gave Mary of Burgundy a gold ring featuring an M spelled out in diamonds. We often get asked about pearls, how they're formed and how they differ from one to another. In simple terms, pearls can be categorised into two groups - NATURAL pearls and CULTURED pearls. Within those two categories you can also define pearls by their FRESHWATER origin or SALTWATER origin. Read on to discover more about the beauty of pearls. WHAT'S THE DIFFERENCE BETWEEN NATURAL AND CULTURED PEARLS? Natural pearls are now extremely rare. They are created naturally in fresh or salt water. A small particle of sand or grit gets caught inside the mollusc and begins to cause irritation. The mollusc produces a silky white substance called nacre (pronounced nay-ker) that coats the particle. Layer by layer, the nacre builds to form a rough sphere. These natural pearls are often misshapen and dark in colour. The majority of pearls you will see in highstreet jewellers are cultured pearls. Cultured pearls are created by artificially inserted a mother of pearl bead or other nucleus into a mollusc - this helps control the shape and size. what's the difference between an oyster and a mussel? Oysters, mussels, scallops and clams are all shellfish and members of the scallop family. They can ALL produce pearls but they produce different types of pearls. They also live in different types of water, for example oysters are commonly found in saltwater, mussels are commonly found in freshwater. what different types of pearl are there? 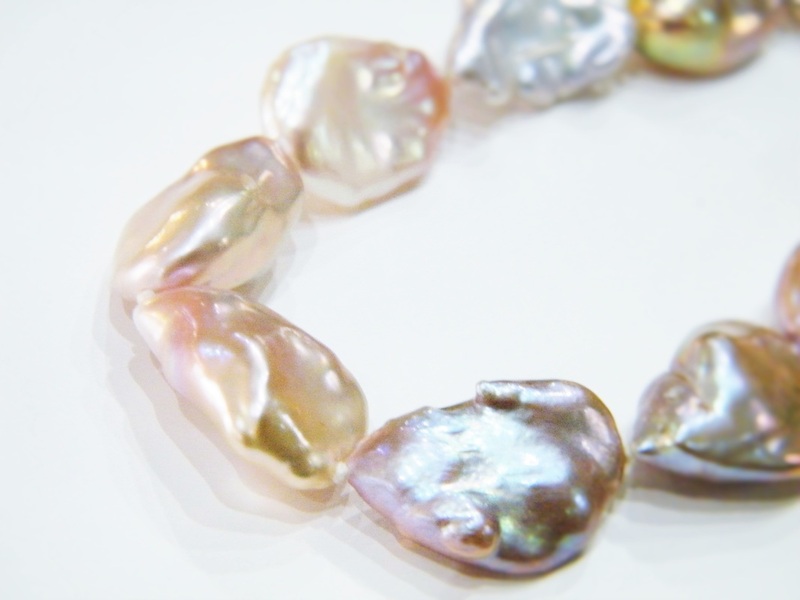 AKOYA pearls are the classic pearl variety. They are produced by the Akoya Oyster in saltwater. They are abundant and favoured by most jewellers for their round shape and mirror-like finish. TAHITIAN pearls are dark in colour. They are also referred to as exotic black-lip pearls. Although they are referred to as black they come in an array of dark colours, which can prove troublesome when trying to match colours. FRESHWATER pearls are the most commonly produced and come in a wide range of colours and shapes. Popular for their quirky shapes, hues and warm lustre. WHITE SOUTH SEA - the rarest of all pearls. Famous for their large size and rare due to their limited cultivation area. They have a soft lustre and are mostly cultivated from the northwest coast of Australia. GOLD SOUTH SEA - Large, luxurious and loved for their golden warm colouring. Each pearl can take approx 2-4 years to develop. 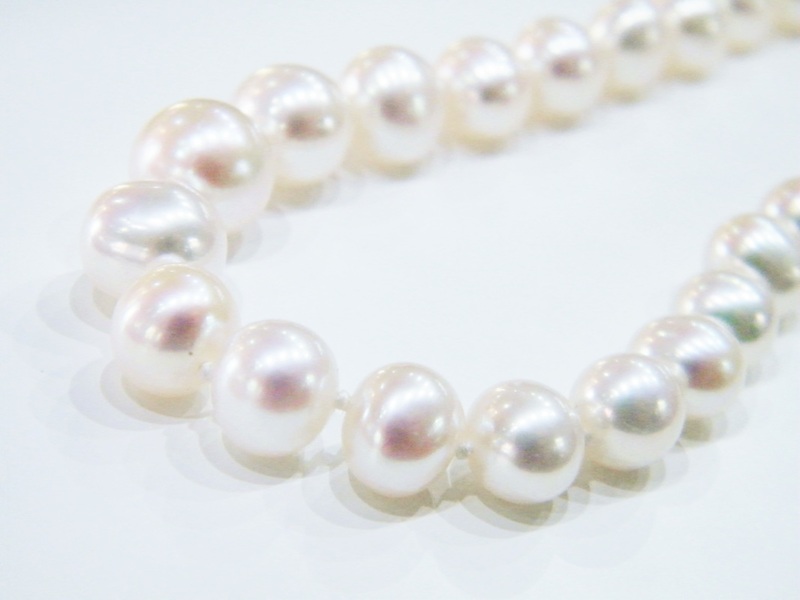 These pearls are primarily grown in the Philippines and Indonesia. Don't forget to buy your special someone something special! We have lots of gifts in stock to order for adults and children. Below is a basic list of milestones to help you remember. Speak to one of our sales consultants to discuss your gift requirements today!